Study profiler websites such as StudyLink.com and StudyLink.co.uk are a cost effective way of reaching a wider audience than may be possible to achieve through your institutions own web presence. As such, these websites are a regular fixture in many higher education marketing plans. Much of the marketing activity on study profiler websites revolve around profile advertising, where you are able to provide descriptive text and information describing the benefits of your institution in order to appeal to any prospective students browsing for information or searching for courses. To make the most of your profile advertising, there are a few important elements to remember when it comes to preparing your copy and in this article we will discuss several of them. Search engines face a difficult task when faced with two or more identical versions of written copy. Which version is most likely to be the original source of the copy and therefore the version that should be indexed in their search results? In instances where there are multiple copies of content present, at least one website (or even other pages on the source website) will suffer from a potential loss of traffic through their omission in search results. When it comes to preparing content describing your institution or individual course offerings, you improve the chance of success for your marketing effort by writing unique copy. For example, you could tailor the copy to the audience you are targeting with your study profiler campaign rather than duplicating copy that already exists on your institution’s website. This may involve specific geo-targeted information or it could include highlighting international student procedures. There are occasions where duplicate content is unavoidable and there are ways to deal with these scenarios such as syndication through web feeds, making information available for other websites to feature whilst linking back to the original content source. Alternatively the study profiler websites may choose to tag their course profile pages as “noindex”, which informs search engines not to index the page in search results and therefore not to compete with the original course pages. When planning your marketing campaigns it is important to know your goals and what you expect to achieve through your activity. This should be reflected in the copy you write in order to maximise the effectiveness of your marketing. For example, if you are primarily targeting lead generation from your study profiler website activity, then you may wish to familiarize yourself with the layout of your course profiles, use your copy to highlight enquiry forms on page and include call to actions in your copy to prompt interested students to submit enquiries. If inbound traffic is your main goal then you should ensure that you include links to all the relevant landing pages throughout your copy and maximise every option available to you to build inbound traffic. If you are unsure what your chosen study profiler websites can offer, your contacts should be well placed to offer advice and guidance. 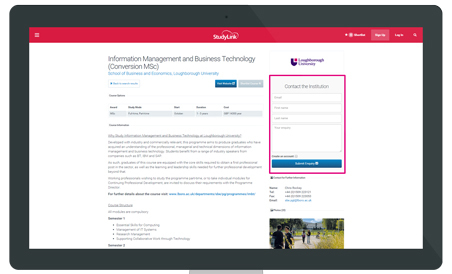 DEM are always on hand to offer advise on how to optimise your marketing activity on the StudyLink.com and StudyLink.co.uk websites. Whether a student is browsing your website or a third party study profiler website, if information is not up-to-date or no longer relevant, then you are failing to provide the best possible advice you can. To improve the chance of your marketing activity achieving your goals, it is important to keep on top of content you have produced and allocate time to review it on a regular schedule. By doing so, you also give yourself the chance to isolate what is working for you and what requires improvement. Capturing the attention of a browsing student should be one of the main aims when writing copy describing your courses or institution. The students browsing study profiler websites are usually at the early stages of planning for their higher education. Try to avoid producing tired advertorial and instead opt for language that is more likely to excite and inspire the reader. Aim to describe in plain terms what a student can expect to learn and how they can apply this to their future career. What is it about studying at your institution that a student would find compelling? It is by making a strong impression at this early stage that your marketing activity can really help to attract students. Digital Education Marketing Ltd has the exclusive right to sell and manage the StudyLink directories worldwide on behalf of Learning Information Systems Ltd. Registered in England No. 7547506.